A recent guest wrote in our guest book....'this place is beyond beautiful'...In addition to the beautiful view of miles of mountains with gorgeous sunsets , what makes Retreat in the Sky so special is the screened porch with hot tub inside. That means you can enjoy the hot tub rain or shine, snow or sleet. Relaxing in the hot tub with snow coming down is an unbelievable treat. Relaxing in the screened porch with the mountain view is also a very special treat! iRetreat in the Sky is an unforgettable place to celebrate birthdays, anniversaries and all those special times. Sitting close to the top of Bear Cove Mountain, our guests enjoy our wonderful, very private, mountain home...and its great location...in the very heart of the Smoky Mountain activities!!! Special features include a breathtaking view of the Smokies from most rooms including the screened porch and deck, a large deluxe hot tub on the screened porch (where you're safe from all the outside critters), a fire log burning fireplace, a beautiful cathedral ceiling in the Great Room, and an outdoor fire pit for those wonderful wood burning campfires. In addition to the hot tub, the large screened porch has a teak wood table and chairs and comfortable furniture. The deck is great for relaxing with your loved one on the swing and enjoying the spectacular short and long range views, grilling out and dining on the umbrella table or rocking and enjoying the wonderful feeling that comes with being in the mountains. Retreat is centrally located for ALL of the Smoky Mountain activities!! We offer a great location. Just minutes to Bryson City, the Gateway to the Smokies... the Great Smoky Mountain Railroad... Fontana Lake, a beautiful mountain lake where you can swim, fish, and rent a pontoon boat for half or the entire day... the Nantahala Outdoor Center for whitewater rafting, ziplining, horseback riding, biking, and fun restaurants... Cherokee, you can try your luck at Harrah's Casino... Deep Creek for tubing, hiking, and picnics...the Smoky Mountain Country Club which is a beautiful mountain course and open to the public....the Blue Ridge Parkway...where is there a more beautiful drive??? And maybe best of all... Ingles Supermarket is only five minutes away. But...if you're looking for complete seclusion, getting totally away from the hustle and bustle of everyday life...and doing nothing more than relaxing, reading a good book and enjoying being alone together...You will love Retreat in the Sky...the view is majestic and the only neighbors are the birds and occasional wild turkeys that come to visit..
* Check-In after 3:00 pm and Check-Out by 10:00 am. * Our road association does not permit motorcycles or trailers. Be sure to visit our other vacation home vrbo 7436. It just might be available if Retreat is not. We are celebrating the 19th anniversary since we built and opened our vacation home to guests. We have learned a lot (and are still learning) about what makes a great vacation and what we need to do to help our guests have one! Ty and I have talked with and met many wonderful new friends who have stayed with us from all over the USA, plus England, the Netherlands, Germany, Brazil, China, Norway, Canada and Finland. We thank you for looking at our web page and we hope you have an opportunity to vacation or visit with us at Retreat in the Sky. Ty and I have been sharing our vacation home, Retreat in the Sky, with guests for over seventeen years. It has been fun, sometimes very challenging...but most of all...a rewarding experience. Our goal is... and has always been ....to provide a wonderful vacation experience for our guests..
We fell in love with Bryson City the first time we visited. It is quaint, friendly and surrounded by beautiful mountains. We found the perfect spot to build our second home. It's close to the top of Bear Cove Mountain in the Smokies. Our view is beautiful. Retreat in the Sky has a privacy that is hard to describe. Our first home is three hours away and seventeen years later, with our car packed with all our stuff, heading for Bryson City and our Retreat in the Sky, we're still excited.... after all these years, we still can't wait to get there. Sitting on the swing on our deck...enjoying the beautiful view...is the ultimate in relaxation. Retreat in the Sky can only be reached by driving up the private road and then you drive up some more on our paved driveway. We are not on the road so no one can see us or drive by us. So you see, we also have the ultimate in privacy. 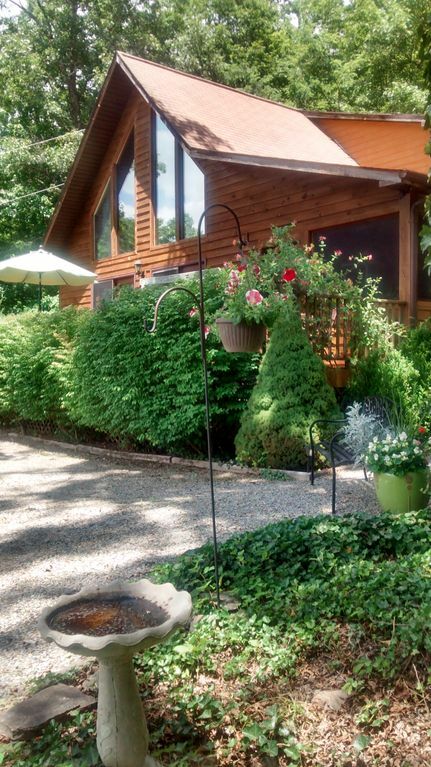 We not only have a beautiful deck filled with flowers and a wonderfully landscaped setting, but a large screened porch complete with hot tub and a great place to hang out. We're only five minutes from Ingles Supermarket, the quaint town of Bryson City and only ten minutes from just about everywhere else. We took a survey from vrbo/homeaway a few years back that results showed that only 21% of property owners that rent their vacation homes use it themselves. We use ours every chance we get. Not only because we love being there but because we want to maintain the high standards we set for ourselves in maintaining our beautiful vacation home. .
Beautiful short and long range mountain views! There is no longer telephone service at Retreat. However, cell phone service (except for Nextel/Sprint) is excellent! Bookcase with lots of popular books. 700 feet of outdoor living space. Deck and Screened Porch with Hot Tub. Rain or shine, you will love the hot tub! You don't have to go out in the scary dark with the critters from the woods coming out. The hot tub is inside the beautiful screened porch. What makes Retreat in the Sky so special?? Maybe it's that the road in Bear Cove is mostly paved and you don't need a 4-wheel drive vehicle to reach it, or maybe it's that it's so convenient, only a few minutes to Ingles to pick up those limes you forgot, then maybe it's because of the privacy, it sits up high on the mountain all by itself, you would never have to see or listen to any other vacationers, but then maybe it's the view, whether you're inside or out, the view is everywhere and it's beautiful, could be the hot tub; most hot tubs are outside, yours would be inside the screened porch, you could use it rain or shine and not have bugs or critters...maybe it's the comfort, pillows everywhere, maybe that's it, maybe it's having a deck AND screened porch, sometimes you could even want privacy from each other, or even maybe the outside woodburning firepit for marshmallows and fun. We love it all and we think you will too!! The most exciting new activity has to be ziplining....our guests just rave about how much fun it is...take a ride on the Blue Ridge Parkway... it is unforgettable...pack a picnic lunch (picnic pack for two at Retreat for guests use) and mountain gaze, and you must go to Highlands and Cashiers (great shopping and restaurants) and visit all of the waterfalls in the area, the Biltmore Estate in Asheville is only one hour away...you should plan to spend the entire day as there is so much to see, go for a hike at the Joyce Kilmer forest or Deep Creek, visit Dollywood and stop at all the outlets on the way, Win some $$ to take home at Harrahs Casino in Cherokee and enjoy a great dinner there as well. You will NEVER run out of things to do. Or, never leave, sit on the deck at Retreat in the Sky and enjoy the privacy, the wonderful view and each other!